Product Information - Savic Stuart Hamster Cage Sporting a stylish green color, the Green Stuart Hamster Cage from SAVIC can be an excellent choice for your small pets. The built-in house serves well as a hide-out for your pet, while the ability to attach a drink bottle makes sure they never long for water. 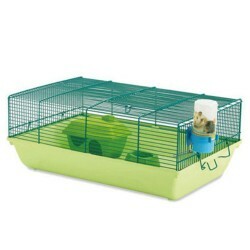 The dimensions of 18 x 12 x 8 inches make sure that your hamsters can run around freely inside it without being bogged down for space. A one stop shop for home d?cor and furniture, Pepper fry sells a home product every 30 seconds.